"A son and grandson of four-star admirals, McCain carried that legacy into battle and into political fights for more than a half-century. It was an odyssey driven by ambition, the conservative instincts of a shrewd military man, a rebelliousness evident since childhood and a temper that sometimes bordered on explosiveness. "As a Navy lieutenant commander, he spent 5 1/2 years as a captive during the Vietnam War after his plane was shot down over Hanoi. He suffered broken arms and a shattered leg, and during his captivity, he was subjected to solitary confinement for two years and beaten frequently. "Often he was suspended by ropes with his arms lashed behind him. He attempted suicide twice. His weight fell to 105 pounds. He rejected early release to preserve his honor and to avoid an enemy propaganda coup or demoralizing his fellow prisoners. He finally cracked under torture and signed a 'confession.' No one believed it, although he felt the burden of betraying his country. "To millions of Americans, McCain was the embodiment of courage: a war hero who came home on crutches, psychologically scarred and broken in body, but not in spirit." No, never in spirit. Yes, there were giants in the Earth in those days and one of them was John McCain, whose name will not be forgotten but honored -- as it was then and will be in these times and forevermore. As a rival for his party's presidential nomination in 2008, Mitt Romney, put it, "John McCain defined a life of honor." 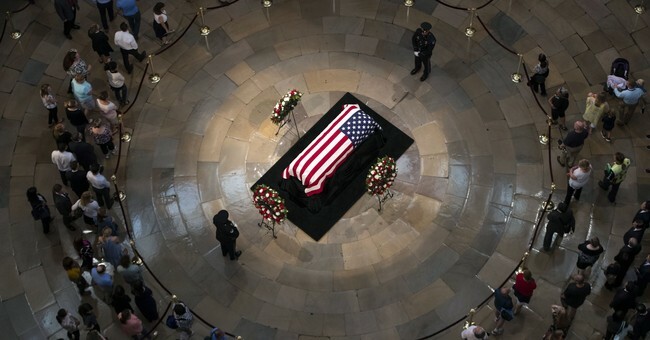 He was a giant among political pygmies, always faithful and even modest about the place he had earned in American history. It is hard to imagine this warrior in war and statesman in peace as ever resting. But in an age of tinpot heroes given to celebrating mainly themselves, he stands out as an honorable public servant, an unbeatable warrior and a great man who in the end crowned all his other achievements by exhibiting a modesty no one might ever have expected of his younger, restless self.